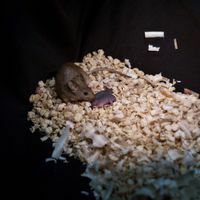 Researchers report growing a mouse embryo using two types of early stem cells. 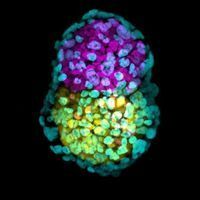 A stem cell-modeled mouse embryo at 96 hours (left); Mouse embryo cultured in vitro for 48 hours from the blastocyst stage (right). 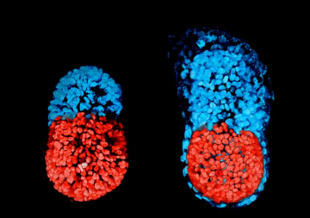 The red part is embryonic and the blue extra-embryonic.IMAGE: SARAH HARRISON AND GAELLE RECHER, ZERNICKA-GOETZ LAB, UNIVERSITY OF CAMBRIDGEScientists claim to have created an artificial mouse embryo using two types of stem cells—embryonic stem cells and extra-embryonic trophoblast stem cells, which normally form the placenta. They reported their results in Science yesterday (March 2). 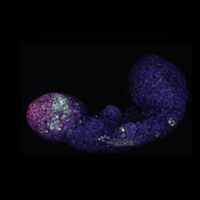 Zernicka-Goetz and her colleagues placed the mixture of embryonic and trophoblast stem cells onto a 3D scaffold that mimicked the extracellular matrix and aided in the nascent cells’ development. 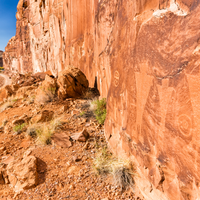 Four and a half days later, the group of cells on the scaffold had architecture and morphogenesis resembling a natural mouse embryo.